Last month was the month of the item server. This month I am working on the support infrastructure. 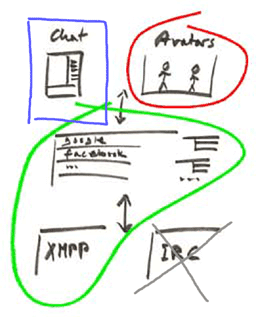 The client is supposed to paint avatars and objects on Web pages. To do this, it needs a fair amount of support. a user account on the server. The user account will be created when the client starts for the first time. 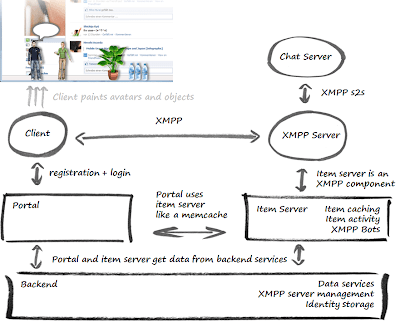 an identity service which provides avatars and items to the client. all this data wants to be stored persistently in several databases. These are the services I am currently building. 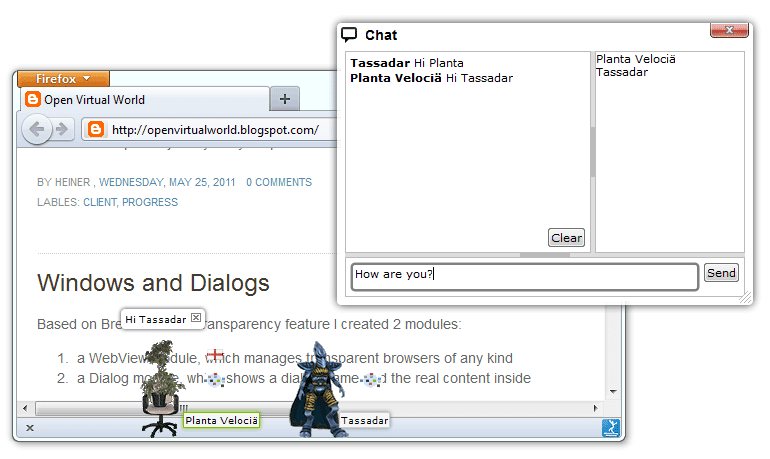 The goal is to make using the Open Virtual World client very easy. Just install and go. 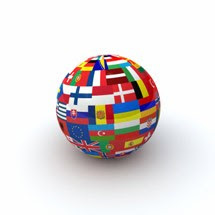 I am happy to announce the 6th Open Virtual World meeting. 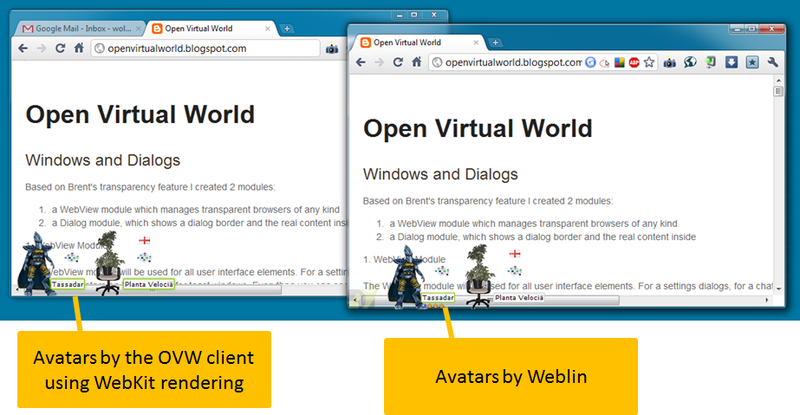 Just in time for GDC Europe 2011: the Open Virtual World client is now "Ready for Developers" who want to build their apps on the Web Avatar platform. The Open Virtual World project will soon publish a complete client which users can download. Until then, developers get early access to the platform. We now have extensions for all 3 major browsers: Chrome, Firefox, Internet Explorer. See the image where I am on this blog page with my avatar and 3 different browsers at the same time. If my avatar moves in one browser, then it moves in all browsers. If I chat in one browser, I chat in all at the same time. The client logs in to the chat room only once. But the avatar is shown on all browsers. This is very different from weblin where you could only be on a page with on browser. Other browsers of the same page/domain had no avatars at all. Initially I wanted to defer Chrome support until after the release. But it is much better to have Chrome support, because I Chrome is my main browser. The client needs lots of day to day testing. Now it is being tested all the time while I am doing my normal web browsing. By the way: a weblin just private chatted to me, but there is no private chat yet. I just saw it in the logfile, but I could not reply. Do we need private chat early? The core software of the client is ready to be released. I am already using the client day to day. I wish there were a Google Chrome extension. But it has only Firefox and IE currently. So I am using more Firefox than usual. 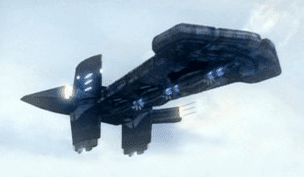 The biggest remaining problem: although the software is ready, it needs configuration. 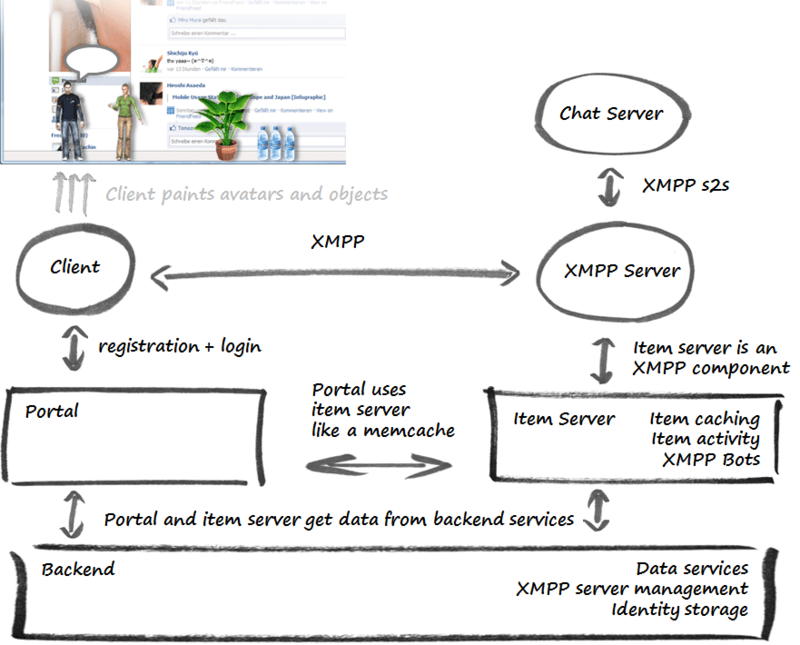 If you have a web server which hosts an avatar description and if you have an XMPP account and if you are prepared to add both to the config file like I did for my tests, then the software works for you. This is probably not the case for most of you. Therefore, I have to add a bit of auto-configuration before I can release the software (is this correct?). I can release now, but would you want it with so much work on your side? Tell me what you think. if two WebKit instances are loaded simultaneously, which use the same JS file from the local disk, then initializing one of the JS engines sometimes fails. The average WebKit programmer will never experience this. The average WebKit programmer uses WebKit to make a web browser. And web browsers do not create many instances simultaneously. You press CTRL-T to open a new tab. Then another. Not two at the same time. Especially not from the local file system. Maybe that's the reason why nobody discovered the "feature" before. Anyway, this means, that creation of WebKits must be serialized. 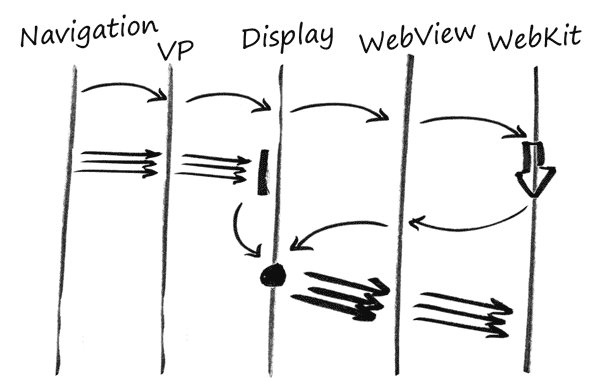 This in turn, introduces all kinds of asynchronous behavior, which must be handled properly in many places. Asynchronous programming is always more challenging than spaghetti coding. Fortunately the client is message based. 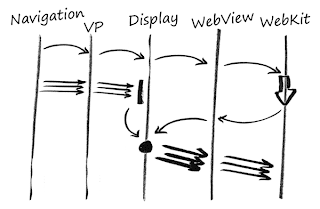 The image shows events which wait for other things to complete, before they are forwarded. In other words: the display must be loaded before it can show something. As simple as that. This kept me busy several evenings and made a huge commit. Now I can continue with the setup/install process. IE Support: I implemented an IE browser helper which connects to the client and tells about opening and closing of tabs, about URL navigation and tab switches. System Tray Icon: a small fun project. Since the client has no window, we need something else to control it. I created a small system tray icon which can start and stop the client. Autostart: this was the easiest task. Just a registry setting, configured by the system tray icon menu. Next is the Web site. We need some place to download the installer and a simple way to configure the avatar, e.g. change animations and nickname. Finally, we have to bundle all files and create an installer for Firefox and IE extensions. Not a simple task, especially the IE installer. And finally, finally there is much testing required because we want the installer to do it's job smoothly. Most of these tasks are of medium size. We might defer Google Chrome support until after the first beta release. Maybe someone from the community wants to take this task. We hope to complete these tasks until August 2011. Some of these tasks are big chunks of work. But most will be done until the end of this year. This is the brand new chat window. It is HTML based. 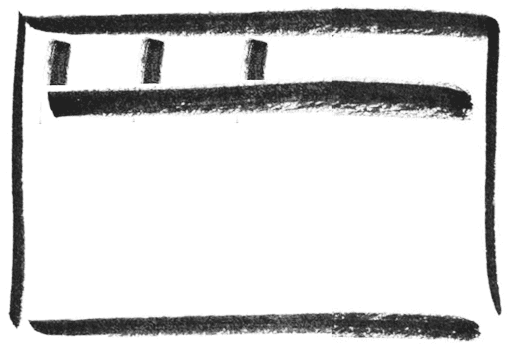 See the bold user names: a single line CSS style. See the resize bars between chat-out panel, chat-in panel, and participants panel: just a few lines of HTML with the help of jQuery UI Layout. Do you remember a blog post one year ago about "Starting Avatar Display Development"? 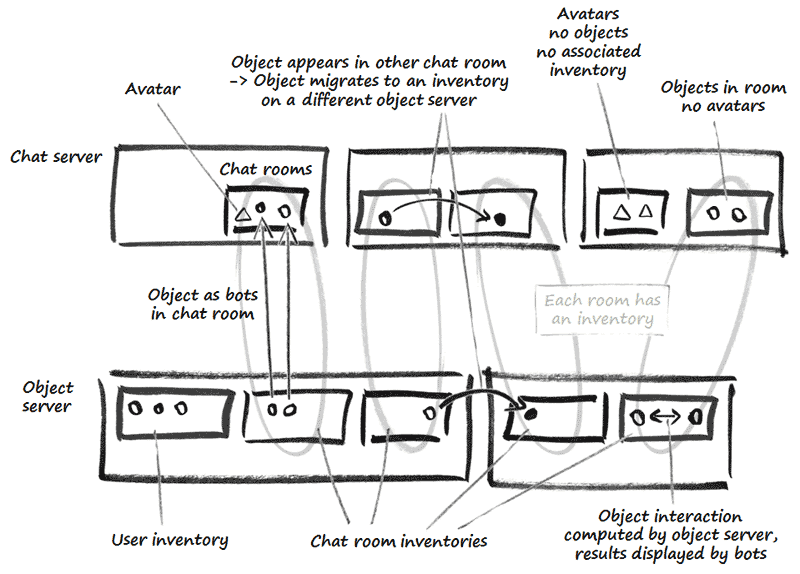 This was after the client core and protocol was implemented, but before you could see avatars. Now the chat is implemented and I can paint a new picture with a blue box around the finished chat module (there is also a grey cross over the IRC protocol. We do not need it now. IRC is just a future option). All this means, that the client is basically complete. Web portal: a portal like weblin.com would be nice where you can change avatar images. There is still much to do. It is not configured for normal users. It is for people who know what they are doing. It has still less features than weblin. It is an alpha version. But it's cool and it's on the way. 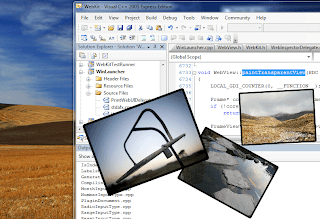 The WebView module is used for all user interface elements. For a settings dialogs, for a chat window, for avatars on Web pages, for toast windows. Everythng you can see on the screen. 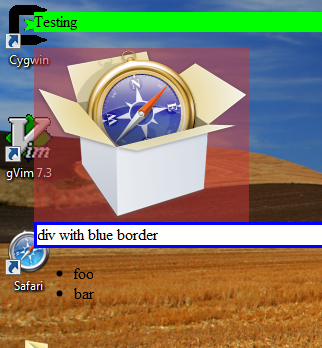 The Dialog module configures window border and window controls. The outside is identical for all dialogs. The window content is managed by whatever HTML page is put inside, be it a local page from the file system or a remote Web page. 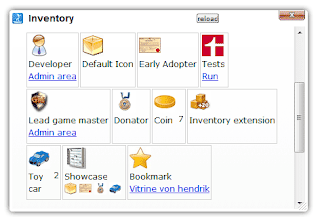 Examples: an inventory window and the current test dialog. Do you prefer the Mac theme? Remember: it's all HTML. You can tell, that it is HTML from the small (reload) button on the window border. This button is for testing only. It will disappear later. Next is the avatar display. Brent's changes to the WebKit code have been added to the trunk (http://trac.webkit.org/changeset/84990). We now have an HTML renderer at our disposal to create a UI with web technologies. Expect UI development soon. The Open Virtual World project awards the bounty to Brent for step 1 and step 2. We agreed to redefine steps 3 and 4 for more advanced features later. We thank Brent for his contribution to the project. This was really fun. Brent Fulgham is currently working on the transparency feature for WebKit. Brent is the developer of the WebKit-Cairo port. It looks like the bounty will be claimed soon. Here are first impressions of the test. What does this mean for the project? We will soon be able to start working on the GUI. The GUI is the last missing part of the new OVW avatar client. Thanks to Brent, the GUI will be purely HTML based. That's the future folks: Web technologies, CSS, HTML, SVG, Canvas, WebGL. Later we might also incorporate the multi-process rendering and WebGL developments of WebKit. This means, that rendering will be even faster in the future and we can support real 3D avatars. Also, thanks to Lupus Labs for sponsoring this open source bounty. The OVW project needs a transparent browser as GUI platform. Transparent browser means, that if I set CSS transparency of the HTML-body to 0.5, then I want to see the desktop partially. 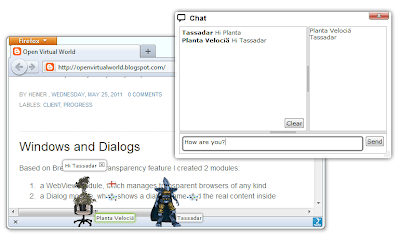 All graphics and dialogs of the OVW client will be displayed by this browser. There will be no other native windows or GUI components. There are so many other things to do in the OVW project. We would like to outsource this task to people who have browser library know how. We would like to sponsor your open source work, and work on other OVW parts in the meantime. 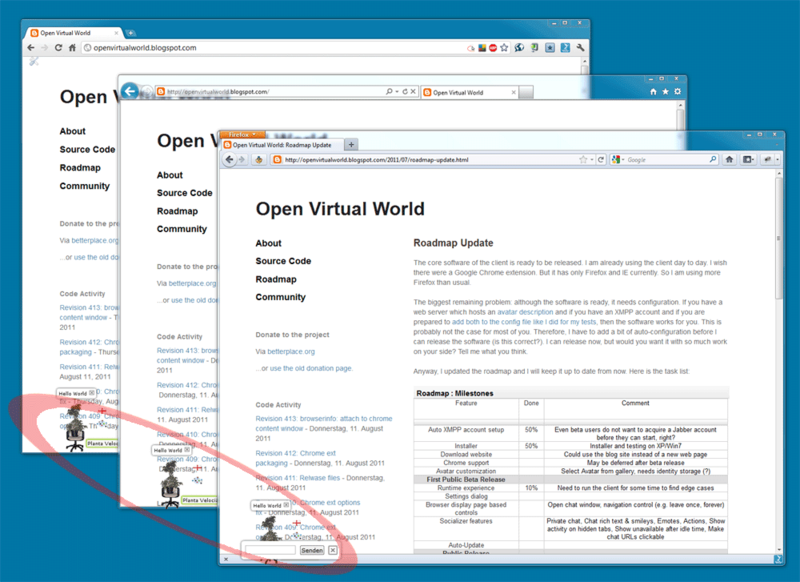 The transparent browser will be used by a OVW client plugin module. 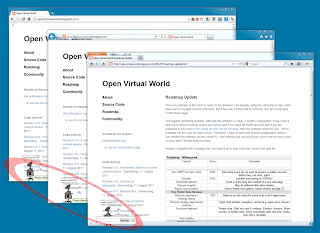 We will wrap the OVW specific module around the transparent browser library. What we need is a transparent browser DLL, which our GUI module DLL can use. To be able to integrate the transparent browser into our project, we need a MS VisualStudio project which compiles all required components, links them into one or more DLLs and has a driver program which teaches us how to use the transparent browser. We would like to add features later, hence the need for a compileable project, not just a release DLL. Yes, we know that we can build WebKit from SVN, but it's not simple and there is so much else to do. 1 k € for a DLL which paints a web page on a transparent window incl. a sample driver program (which has a URL input). We can compile it. 1 k € for keyboard/mouse input, IFRAME support, and max 20 MB. 1 k € for additional cool stuff to be defined later, e.g. MSVC 2005 because it lets us omit recent C runtime libs making the package smaller, helping us actively to use the thing, shrinking to 10 MB including all support DLLs (beware of the ICU data DLL), WebGL support, DOM API support, helping us to channel HTTP over the OVW client's HTTP component, etc.